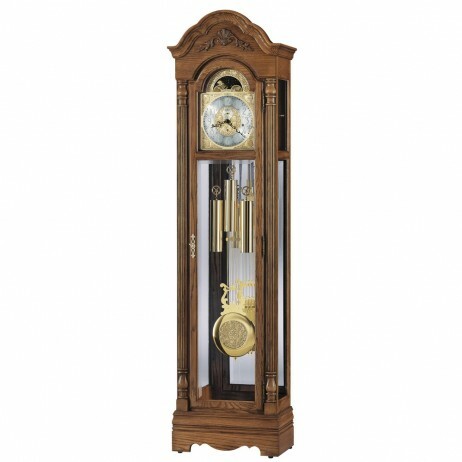 Grandfather clocks come with a grandeur all their own which enables them to transform their surroundings with their delightful air of sophistication. 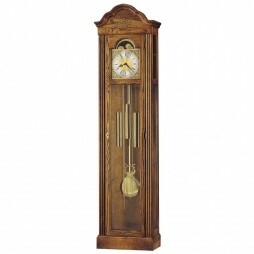 And with the Howard Miller Gavin Mechanical Floor Clock, you too can add that special ambience to your living room or hallway. And it is all thanks to its ornately designed frame in a medium brown Oak Yorkshire finish, which features an arched bonnet pediment with a decorative shell and overlay. This delightful frame which has also been fitted with beveled glass is also complemented by its dial. Featuring corner spandrels, a center design and a lunar dial, it also comes with a silver chapter ring and Arabic numerals which stand out against the sleek shine of its polished brass. A set of matching weight shells and a lyre inspired pendulum further add to the clock?s gleaming appeal. 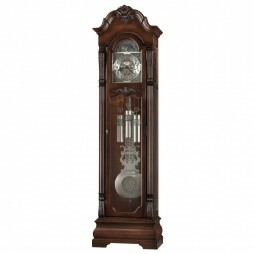 This grandfather clock is also more suited to uneven surfaces thanks to its adjustable levers which have been placed beneath each of its corners. This Grandfather clock features an arched bonnet pediment highlighted by a decorative shell and vine overlay. A glass mirrored back highlights the polished brass finished pendulum with a decorative center disk and polished brass finished weight shells. Reeded columns with turned top and bottom caps add an elegant touch, and the decorative cut-out on the sculpted base completes the picture. Add a touch of happiness and colour to your living space by putting up the funky and trendy Howard Miller Ashley Grandfather Clock. Finished in Oak Yorkshire on select hardwoods and veneers. 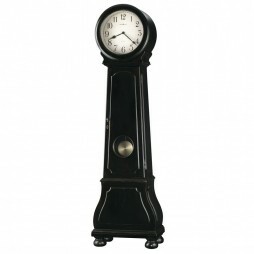 This floor clock offers arched pediment with delicate embossing. The polished brass finished dial features an ornate, gold tone center and a silver tone chapter ring. 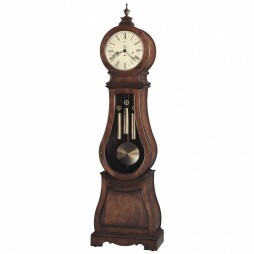 The Howard Miller Nashua Floor Clock is designed and assembled in the USA.